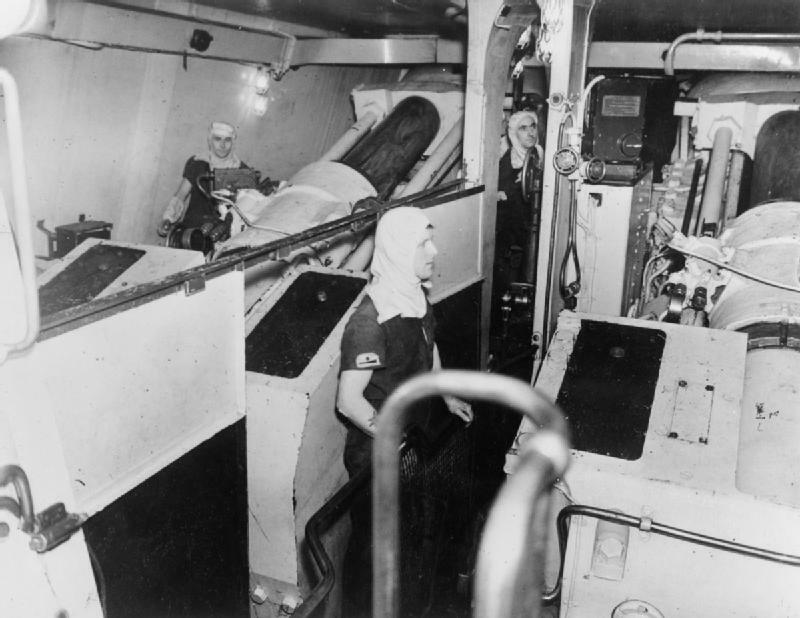 Aft turret on HMS King George V about 1940. Note the UP AA Rocket mounts on top of the turret. ^The weight given for "Early guns" is for guns No. 51 through 90 which had the original breech ring design. The weight given for "Later guns" is for guns No. 91 through 136 which had the altered breech ring design. In addition to these weights, a balance weight was attached near the breech in order to move the center of gravity closer to the turret face plate. This allowed a higher elevation without having to deepen the gun wells, thus reducing the size of the gunhouse. Including the balance weight, guns No. 61 to 90 weighed 90.588 tons (92.042 mt) and guns No. 91 to 136 weighed 91.488 tons (92.956 mt). ^The propellant charge was in four bags. ^For Treaty compliance purposes, these ships were listed as carrying 80 rounds per gun but they actually had space for 100. ^The original outfit was 100 rounds of APC per gun, but by mid-1943 five of these had been replaced by time-fuzed HE. This data is from "Battleships: Allied Battleships in World War II" for a muzzle velocity of 2,400 fps (732 mps) and is partly based upon the USN Empirical Formula for Armor Penetration and partly based upon official data. 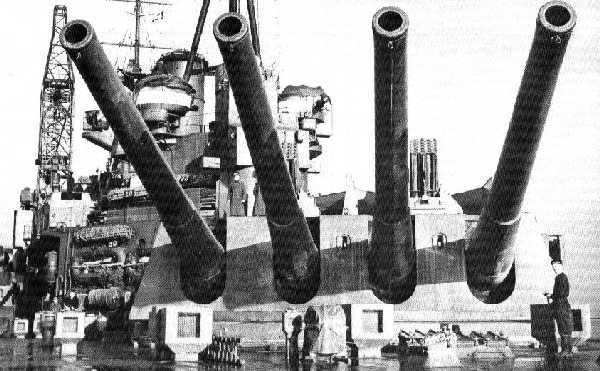 ^"The Big Gun" states that the quadruple mounting had over 3,000 working parts. ^Training was by one of two swashplate engines, 160 bhp in the quads and 70 bhp in the twin, which drove the turrets via a worm gear. Elevation was by hydraulic cylinder and piston connected to the rear of the cradle and run out was via compressed air. RPC equipment was never fitted to any of these ships, they used "follow the pointer" style control throughout their careers. The following description is adapted from "Naval Weapons of World War Two." Propellant bags were transported from their storage locations in the magazines on roller chutes into hydraulically operated cages that raised them to the handling room. A and B mountings had four cages, but Y turret had two. Y turret had two double-door scuttles in place of the other two hoists, primarily because of the reduced vertical spacing for this mounting. In the handling rooms, bags were manually rolled or slid over to open waiting trays from which they were then manually carried to cordite hoppers. There was one hopper per gun on a circular platform connected to the hoist trunk. Power-rotated scuttles and chain rammers transferred the bags to the lower hoist cage. This cage had two compartments which each held two propellant bags (half charge). 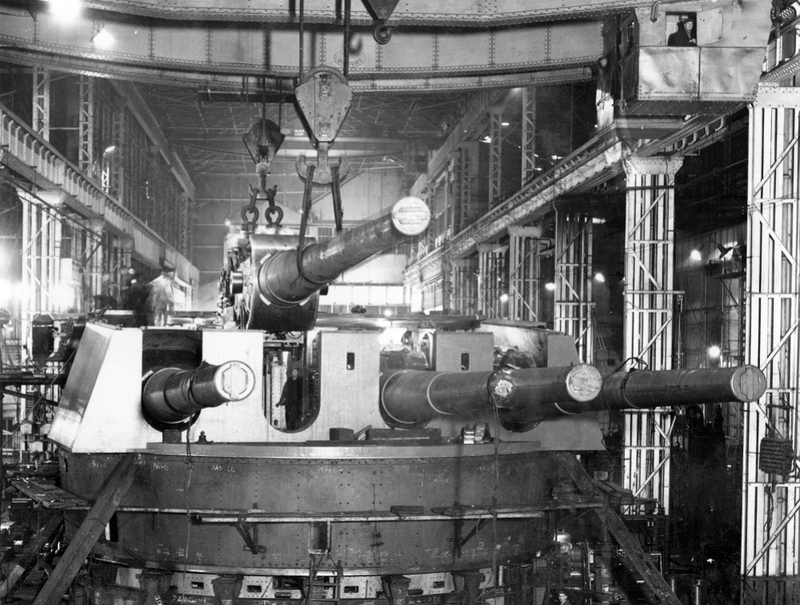 Projectiles were moved from the shell rooms by overhead trolleys and then rammed over hinged shell trays through openings normally closed by watertight doors to the revolving shell ring in the shell handling room. The shell rings for the quad mountings held 16 trays in four groups spaced 90 degrees apart while the twin mounting had 8 trays in four groups spaced 90 degrees apart. The shell room ring could either be coupled to the ship or to the revolving stalk. When coupled to the ship, the shell ring was driven by a 24 bhp hydraulic engine that was connected via a flexible coupling, friction clutch, worm gear and pinions with allowance for eccentricity and a rise and fall of up to 1 inch (25 mm) of the ring in relationship to the mounting. When coupled to the stalk, a similar hydraulic engine was used but the connection to the shell ring did not have any provision for eccentricity or relative motion. [Editor's note: This ring proved not to be flexible enough to withstand the twisting of the ship as it moved through the waves or made sharp maneuvers and was a source of jamming] Projectiles were rammed into the upper hoist cage when the ring was coupled to the stalk. The lower hoists were operated by winches having two reel drums of different diameters on the same shaft which meant that the propellant and shell cages arrived together at the working chamber below the gunhouse. Projectiles and propellant bags were rammed from the cages into traverses which ran on rails across the chamber to the gun loading hoist cage. This was a three level container with the shell on top and half charges in each of the two lower compartments. The hoist then ran up to the gunhouse at a slant such that the loading cages were at the +5 degree loading angle when they reached the gun breeches. After the shell was rammed, the cage incremented upwards twice as the half charges were rammed. Magazines were located below the shell rooms. These mountings had very elaborate flash precautions, perhaps overly so given the problems encountered during World War II. These turrets had a vertical roller race similar to the ones added to Nelson and Rodney in the 1930s. These were located just below the main horizontal roller races. The gun axes were 96 in (244 cm) apart in both the twin and the quad mountings. Rangefinders in A and X turrets had a baselength of 41 feet (12.5m) while the rangefinder in B turret had a baselength of 30 feet (9.10 m). 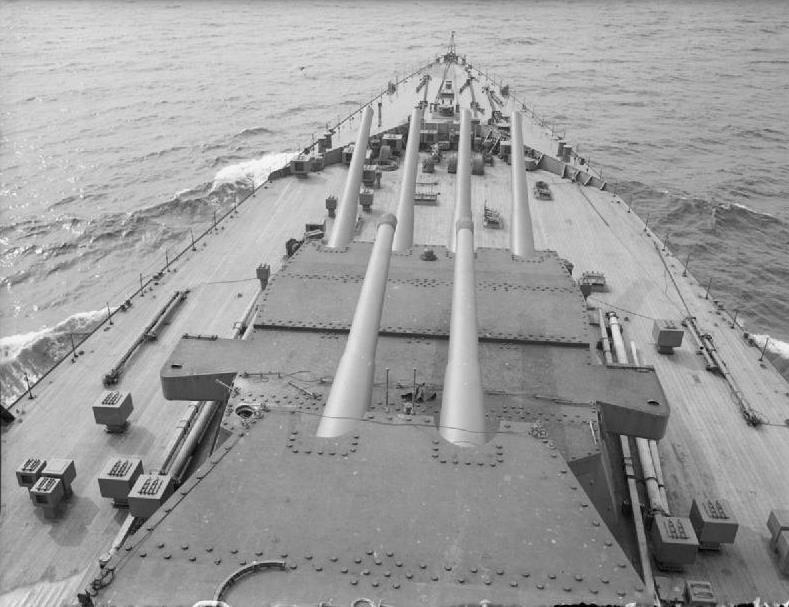 Some details of the problems found in action with these mountings during the 1941 battles: Prince of Wales fired only 55 out of a possible 74 shells during her action with Bismarck. Her problems included jammed shell rings and associated fittings. King George V fired 339 shells during her engagement with Bismarck compared to 380 fired by Rodney. "Initially she did well achieving 1.7 salvoes per minute while employing radar control but she began to suffer severe problems from 0920 onward [Note: King George V had opened fire at 0850]. 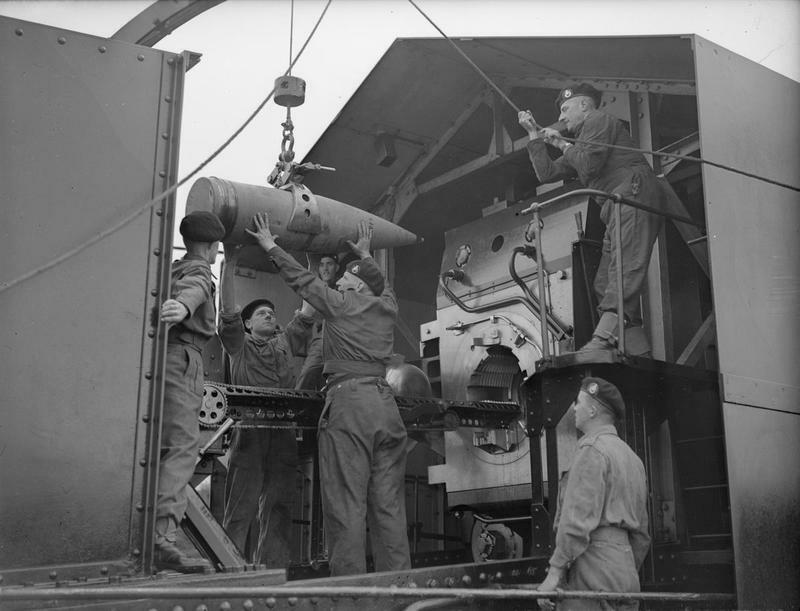 'A' turret was completely out of action for 30 minutes, after firing about 23 rounds per gun, due to a jam between the fixed and revolving structure in the shell room and Y turret was out of action for 7 minutes due to drill errors. . . Both guns in B turret, guns 2 and 4 in A turret and gun 2 in Y turret were put out of action by jams and remained so until after the action - 5 guns out of 10! There were a multitude of other problems with mechanical failures and drill errors that caused delays and missed salvoes. There were also some misfires - one gun (3 of A turret) misfired twice and was out of action for 30 minutes before it was considered safe to open the breech." "Comparatively little experience had previously been gained of the reliability of the turrets. The prolonged practice firing for the King George V had been carried out only in one turret. It was fortunate that the action [against Bismarck] was not prolonged, because the 25 rounds per gun practice previously planned would not have shown up so many of the defects." Following the Bismarck battles, King George V and Prince of Wales had numerous modifications made to their ammunition supply safety interlock system; the watertightness of the mantlet plates was improved; and the existing drains in the shell rooms were enlarged and additional drains fitted. These changes were incorporated into the rest of the class as they were being built. During her battle with Scharnhorst at North Cape, Duke of York was shooting for a total of two hours. Mechanical problems suffered included failures of the bridge flash tubes in the working chambers to close completely, the collapse of shell arresters in the lower hoists and a shell-cage defect in A turret, all of which caused some guns to drop out of firing opportunities. All guns suffered at least some failures to fire, with B1 gun being the most reliable, having missed only three out of the 77 broadsides. Notable among these missed salvos: Poor loading drill put A3 gun out of action for 71 of the 77 broadsides. Three guns in Y turret were unable to fire for a 15 minute period, causing them to miss 17 broadsides. Some comments from William Jurens regarding the vertical face plates of these turrets. "The reason for sloped turret faces is primarily geometric. For normal trunnion locations, if the turret face is not sloped back, then for large angles of [gun] elevation, as in post-1930 ships, the gunports get very large and start to eat away at the turret roof. If the angle of elevation is small as on older ships, [then the] angles of fall [of shells fired by enemy ships] would be equally small, so a slanted faceplate which would deflect rounds upward makes sense. If the angle of elevation is large and a vertical front plate is seen to be desirable, as in KGV etc., then one answer to avoiding cutting long slots in the roofplates is to move the trunnions far forward. This makes the overall rotating structure and the guns themselves harder to balance and complicates gun elevation mechanisms. On KGV a compromise was made; the trunnions were moved as far forward as possible, and the front plate was moved BACK as far as was feasible. Even so, the maximum angle of elevation was limited to 40 degrees. There is little saving in weight in moving to a vertical faceplate, in some cases less than none.
. . . moving from a sloped to a vertical faceplate is usually nearly weight-neutral, although some savings can be achieved by thinning the vertical face somewhat as it is now much more oblique to incoming (long-range only) fire than a sloped face is. Several problems remain. On KGV, moving the face back left an inconvenient "D" shaped portion of the top of the barbette uncovered forward of the faceplate, a situation aggravated by the probability that long range fire, even if deflected, would be channeled downwards into the "D". On KGV, this "D" underneath the gun chases was about 115 ft2 (10.7 m2) in area, which needed to be protected at least as well as the turret roof. This added protection would weigh about 13 additional tons. A final problem lies in the construction of the face plate itself. Such a plate is much stronger if it can be made in one piece with two, three, or four (as required) vertical slots cut into it for gunports. This in turn requires at least a thin band of material above and below the port openings to hold the whole thing together. Because the slots are quite problematical in a vertical plate to begin with, there is a tendency to revert to installing a number of smaller plates joined together, which is not as strong, though arguably cheaper to manufacture. Overall, I suspect that vertical faceplates create more problems than they solve, and their advantages (if any) are marginal, which is likely why so few ships ever adopted them." As can be seen in the photographs on this datapage, the quad turrets on the King George V class have a semi-circular plate of armor attached to the lower front plate of the turret. This plate protects the top of the barbette. 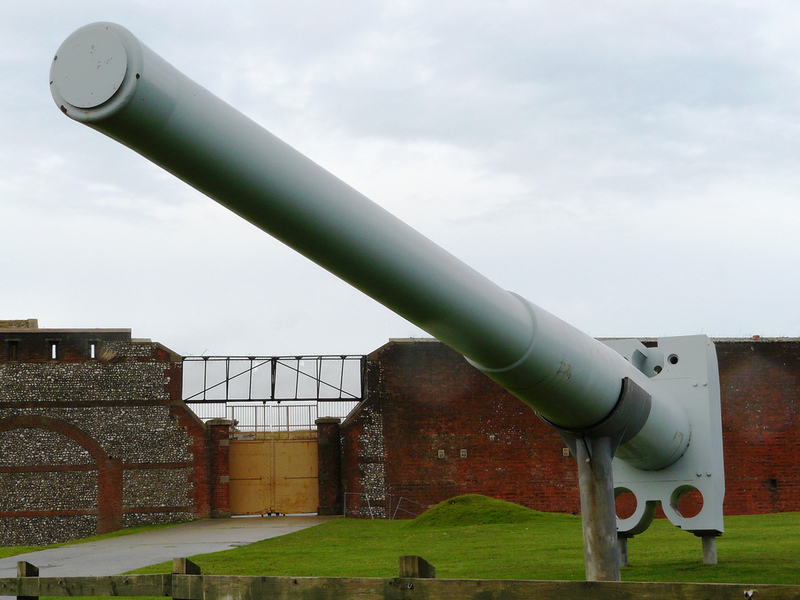 Two guns were mounted at Dover in 1940, one in No. 26 Proof Structure and the other in a 18"/40 (45.7 cm) mounting removed from a monitor. Bow turrets on HMS Prince of Wales. IWM photograph A 3905. Quad Mark III turret under construction. Note that the gun house needed to be dismantled in order to change out the guns. National Maritime Museum photograph. 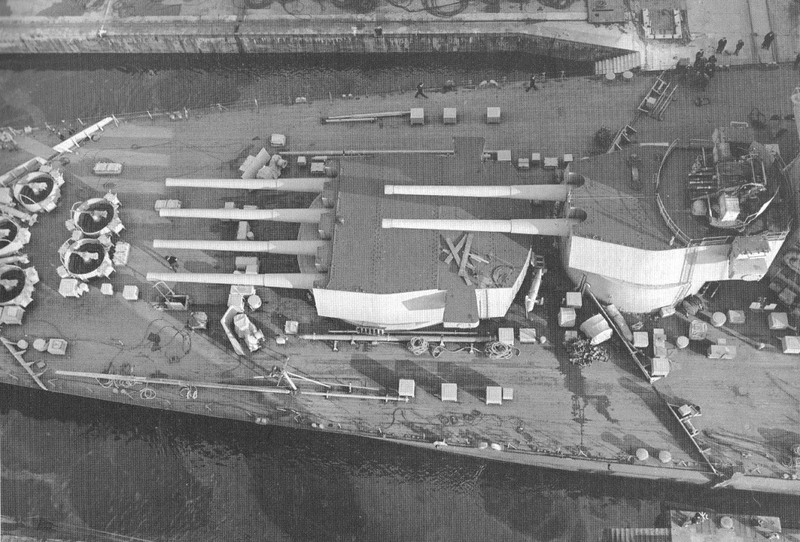 Forward turrets of Duke of York during a refit at Rosyth in 1945. Note the 2pdr on "B" turret and the 20 mm Oerlikon guns at left. IWM Photograph A20166. Interior of one of the turrets on HMS Duke of York. Note that the guns are not separated by flash walls. IWM photograph A 21180. Loading a 14" (35.6 cm) HE projectile. This was one of the coastal guns emplaced near Dover. IWM photograph A 25764. 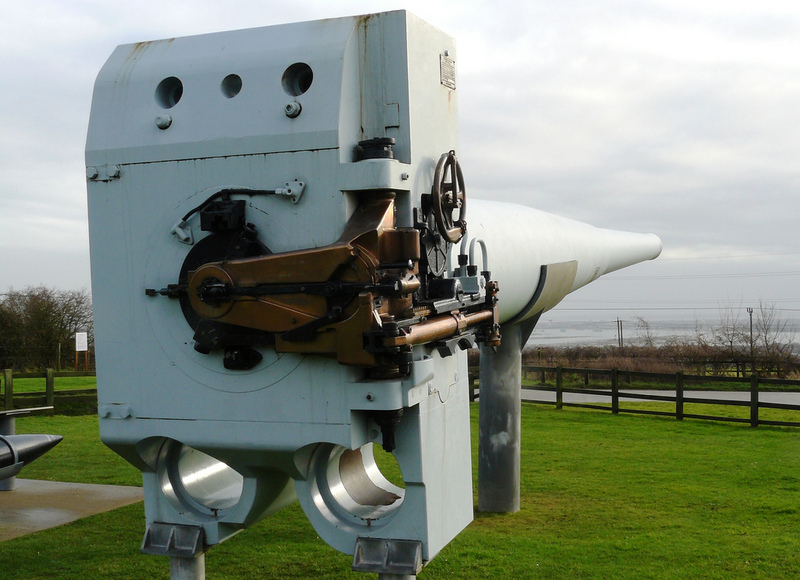 14" (35.6 cm) Mark VII gun at The Royal Armouries at Fort Nelson, Hampshire, UK. Photograph by Ken "GranDadWoof" Irvine and copyrighted by The Royal Armouries.